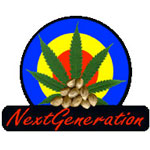 Next Generation is a Canadian seed company that sprouted in 1997 and has a reputation as a reliable source of great quality and unique genetics. Next Generation Seeds are continually growing, testing, and perfecting their strains. They breed with many of the best strains from the Pacific Northwest, Canada and around the world to reach indeed the strains of the next generation! They select only the best for their breeding program.